I’m a historian, not a movie critic. 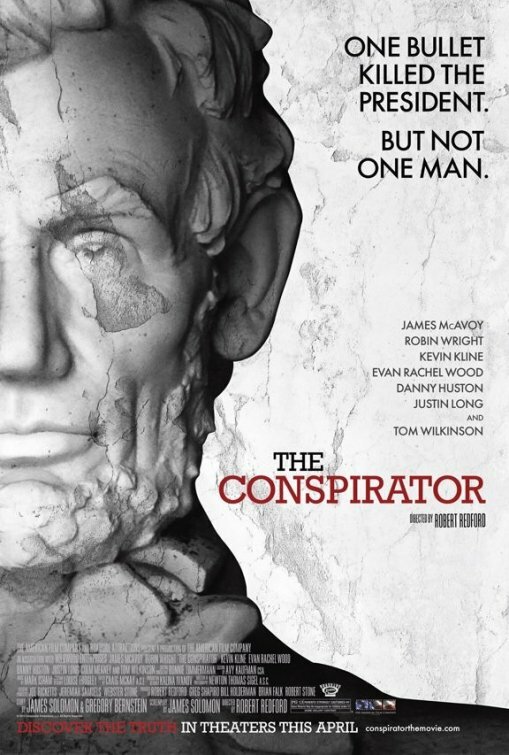 That notwithstanding, I here offer some thoughts on Robert Redford’s movie, The Conspirator, which I caught last week and enjoyed very much. I had been looking forward to this movie. As a Civil War historian and sometimes reenactor, I have been troubled by the dearth of good films depicting the Civil War era. The general public had the good sense to simply ignore movies like Gods and Generals. But mention the title to reenactors and you will hear lamentations and gnashing of teeth. I had high hopes that The Conspirator would break this pattern and it did not entirely disappoint. It did, however, have some troubling flaws. The movie centers on the trial of Mary Surratt, one of the conspirators in the plot to assassinate President Abraham Lincoln. I think most of us know how the story ends. Still, I should probably point out that this article will likely contain details about the plot that someone who hasn’t seen the movie might not want to have revealed. That is to say, here there be spoilers. Redford’s heavy-handed political spin was problematic. He utilizes the story to create a metaphor about government’s abuse of power. A cautionary tale on such a subject is certainly a good thing. However, in this instance it goes a bit far and leads to an idealized and romanticized depiction of Mary Surratt. Character, plot, and historical accuracy suffered as a result. Presenting her in a more realistic fashion, with all her flaws intact, would have been a more interesting story. The script was at times too weighed down by the political agenda, the dialogue stiff, the characters sometimes reciting ideology that did not feel genuine. The character of Secretary of War Edwin Stanton (who did, in fact, want this trial to be prosecuted as quickly as possible) was written as so two-dimensionally authoritarian that he might have been cartoonish were it not for Kevin Kline’s salvaging of the role. Kline managed to make the character human, despite the poor writing. I cringe to think how Stanton would have come off played by a lesser actor. It might have utterly ruined the film. If Stanton managed to come off human thanks to Kline, the same cannot be said of the military commissioners in charge of the trial. They were caricatures. The “bad guys.” A while back, when I first heard about the movie, I wrote a blog entry about a figure I had done some research on, General Cyrus Comstock. He was initially appointed as one of the commissioners but immediately voiced his discomfort with the fact that the civilian conspirators were being tried in a military court. Another commissioner shared his opinion. Both were removed from the commission by Stanton. It seemed to me that Comstock was too peripheral to the story to be represented in the film, but I now wish he had been included. It actually would have strengthened Redford’s central argument that the trial was unconstitutional…and it would have done so in a more historically correct fashion. More important, it would have showed that the commissioners were in fact human and not just a panel of cardboard cut-outs with grumpy faces. One more minor criticism and I’ll get to the compliments. Justin Long and Alexis Bledel should not do period films. I expected Long to come out with, “Dude!” at any moment. More so that any other period film I’ve seen in a long time, this one looked and felt like the nineteenth century. Not that I would know for certain, but I have a general idea. The sets were brilliant, the costumes excellent. The grit, the haze and smoke of the courtroom in the Washington Arsenal felt authentic. There was not a moment when anything about the look of the movie took me out of the period. James McAvoy (as Frederick Aiken, the defense attorney) and Robin Wright (as Mary Surratt) were absolutely brilliant and worked well together. Although I had issues with the way that Surratt’s character was written, as mentioned above, Wright played her with complexity and left just enough doubt as to whether Surratt was lying or sincere about her innocence. This was really well done. With regard to her guilt or innocence, one aspect of the screenplay that worked well was the notion that the prosecution’s evidence and witnesses were weak and questionable. Having read a fair amount on the assassination plot, I happen to believe that Surratt was as guilty as the day is long. The film represented similar pre-conceptions on the part of the characters and compellingly emphasized that accused must be tried on the basis of evidence. And, if the film is indeed accurate as to the weakness of the prosecution’s case (and this is something about which I intend to read more), then the trial was, in fact, a travesty. Thought-provoking indeed. A nice touch was the way in which numerous period photographs were “reenacted,” some during the course of the movie, most used as stills during the ending credits. This contributed to a sense of authenticity. It was probably most poignant during the dramatic hanging scene. When the finished gallows were finally revealed, the entire set looked so like the photographs that my breath caught. A film like that should make you feel like you’re looking back in time. And it succeeded in a number of instances. So, in all, a film well worth seeing. And, despite my issues with its message, I do think this is the best Civil War film made in many years.